This chapter highlights the specific features of open education from the perspective of dynamic (social) equilibrium. It is an attempt to bring the current lines of frontier research in pedagogy with the emergence of open textbooks for the global audience. To broaden the opportunities of open textbooks for self-regulated learning, this chapter analyzes the affordability of open education and the feasibility of open textbooks versus non-open textbooks. On the first line, the open education represents a transition from closed to the open system where co-exist a bio-digital fusion of various objects, processes, and environments. On the second line, the open education is an attempt to explore the complexity of global issues related to the emergence of open textbooks. 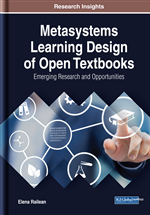 The objectives of this chapter are to discuss (1) the added value of industrialization and digitalization on instructional design of textbooks, (2) the issues of open data, open knowledge, and open pedagogy, and (3) the terminology and the specific features of open textbooks. Quality education is equitable, inclusive, open and participatory (UNESCO, 2017). The equilibrium in education is ensured by an intelligent and adaptive mechanism acting at the “common” level of student, teacher, content, technology, and global context. However, the state of equilibrium can be disrupted by factors (i.e. globalization, ICT, global initiatives etc.) and this lead to irreversible changes and demands. A temporary state of disequilibrium is characterized by increasing flows of data, information, and energy. Equilibrium is held stable by equal but opposing forces. There are still a lot of unknowns about how and what opposing forces keep the dynamic. In a traditional way, a dynamic equilibrium is a mechanism of a system when no net change has occurred. In social science, the term “dynamic equilibrium” is replaced with the term “social equilibrium”. The mechanism of social equilibrium is a hot research question. Ye (2017, p. 1119) describes “social equilibrium” as a generalized Nash equilibrium problem that is a non-cooperative game in which each player’s strategy set depends on the rivals’ strategy set. Social equilibrium was the main theme of UNESCO Second World Congress of OER (2017). In the “Ljubljana OER Action Plan 2017”, adopted at this congress, it is noted that has an important role in helping to promote OER at all levels of education: from early childhood, primary and secondary education, to technical and vocational education and training, to higher education, encompassing non-formal and informal educational contexts. OER initiative is connected with the 2030 Sustainable Development Agenda, adopted in 2015. Therefore, OER is important for sustainable development. The importance social equilibrium is proved also in Cape Town Open Education Declaration: we are on the cusp of a global revolution in teaching and learning. Educators worldwide are developing a vast pool of educational resources on the Internet, open and free for all to use. These educators are creating a world where each and every person on earth can access and contribute to the sum of all human knowledge. They are also planting the seeds of a new pedagogy where educators and learners create, shape and evolve knowledge together, deepening their skills and understanding as they go. Issues of openness and the emergence of open textbooks. It is discussed the terminology of openness, dimensions of education, the emergence of OER, including open textbooks. It is presented the definition of open textbooks, characteristics, distinguishing characteristics from non-open textbooks (also needs to be defined), the context of OER and learning objects, need, historical context/movement, and current status.